Lately I have been obsessed with brownies. I made the recipe I posted recently over and over. I tried different nuts (peanuts, walnuts) and different liqueurs. I also made them with a decreased amount of alcohol and instant coffee powder one time and I have to say they are very versatile! This is a version made with walnuts and instant coffee powder. They tasted almost like a bar of dark chocolate. They are perfect for people who don’t like sweets that much. They were more bitter than sweet as the coffee powder enhanced the taste of the chocolate I used (85% cocoa). I baked them in my square muffin pans and I had to decrease the baking time a bit. That was probably my third or fourth batch. Yeah, I lost count and suddenly the freezer was the home of dozens of brownies. They make such a great snack and because they have so much chocolate, they can be eaten shorty after you take them out of the freezer. But one day I got a little bit tired of the brownies. It was hot and I wanted something else. So I prepared the ice cream maker and the next day was planned around ice cream making. I mixed the batter together before work and churned the ice cream when I came home. At first I wanted to use coconut milk for the base, but many of my ice cream recipes have coconut milk in them. It makes for a rich and creamy base, but there are only so many variations of coconut milk ice cream you can try. At some point it gets boring. So I used soy yoghurt and refined coconut oil instead and with the help of a tablespoon of rum and some guar gum the ice cream turned out as creamy as if I had used coconut milk. The brownies are perfect for ice cream. They don’t harden that much and the slight bitterness makes a great contrast to the sweet and refreshing yoghurt mixture. If you do not have guar gum and/or don’t want to use rum, just leave those out. You might want to use an additional tablespoon of refined coconut oil though. Place almonds and soy milk in a blender. Process until smooth. Add remaining ingredients except for the brownies and repeat. Refrigerate for about 4-6 hours. Prepare the ice cream in your ice cream machine according to the manufacturer’s instructions. If you don’t have an ice cream maker, do this. 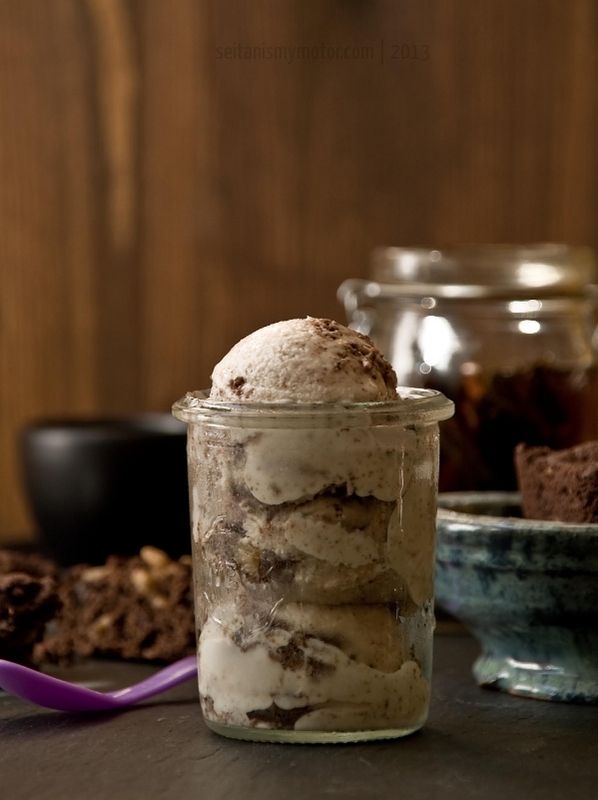 When your ice cream is done, stir in the brownie bites and store in the freezer until frozen properly. 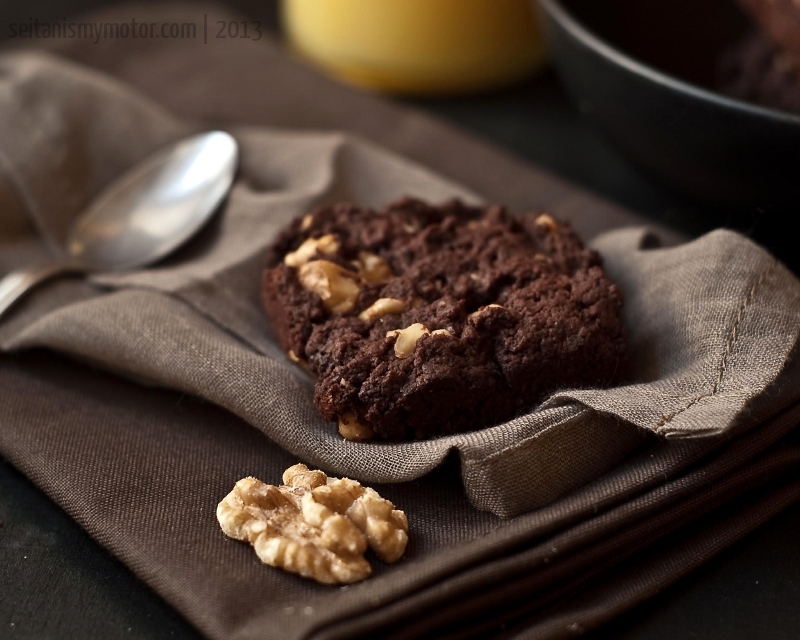 * I used walnuts and added 1 tablespoon of instant coffee powder. Oh, hell yeah! I love how the brownies have crumbled thoroughly into the ice cream mixture. I can only imagine how amazing this tastes. That looks like the most decadent ice cream! I have never used guar gum in ice cream but I am going to try it because I always find mine goes too hard after a day or two in the freezer! Mihl, how wonderful this looks, and perfect for the hot day we are experiencing today in our corner of the world. I could just slurp it up! Thank you, Laura! No, I have never experienced that. I thought the coconut oil blended really well with the other ingredients. This looks like just the treat I’ve been wanting. Can almond milk be subbed for soymilk? I’ve seen a few recipes over the last couple days for brownie ice cream sandwiches, but this is the first recipe I’ve read for brownies IN the ice cream. Ooh Ahhh. I especially like your description of the brownies not being too sweet — I’m a big fan of bitter chocolate. 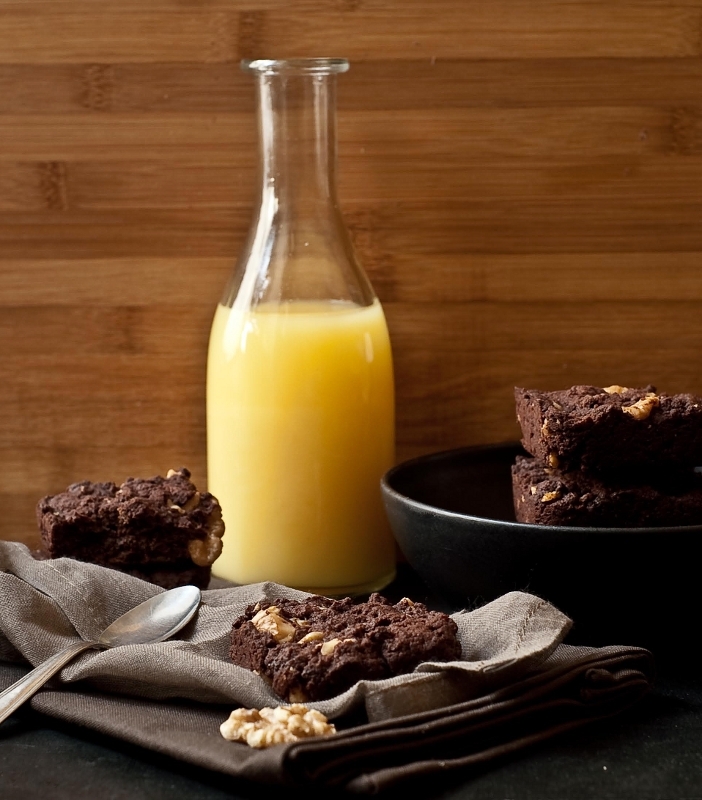 oh my… i am love.. yogurt and brownies.. yes perfect! Oi. 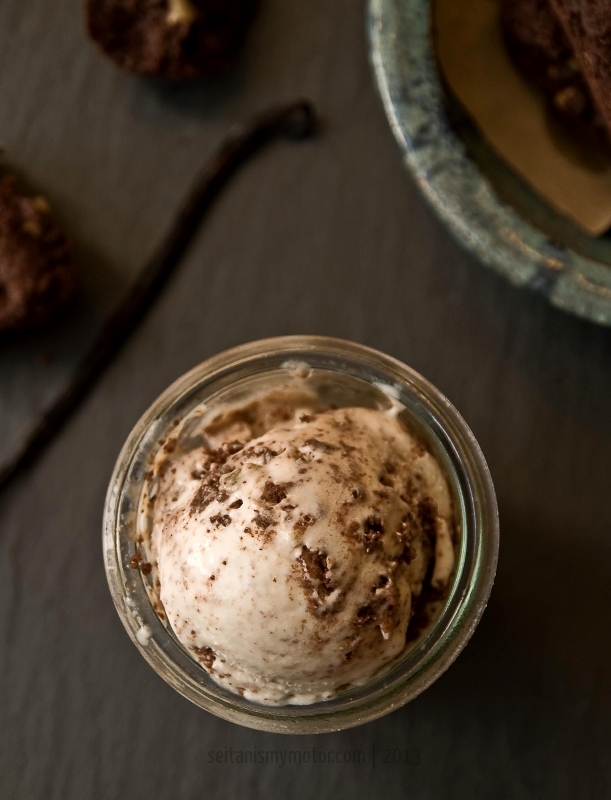 It’s recipes like these that make me want to run right out and get an ice cream maker. This looks insanely good. I know I already said this but yum! I love that you made a yogurt base ice cream as I’ve yet to stumble across a vegan frozen yogurt recipe. Plus brownies!! I totally need to hunt down an ice cream maker before the hot weather hits so I can have this ready to go when the craving kicks in. I have been trying to eat a little less sugar than normal. Last night I couldn’t take it any longer and I too decided to make a frozen yogurt. I mixed up a batch of chocolate. I am hoping it will cure my cravings this afternoon when it gets hot out again! That ice cream looks amazing! I’ll have to get myself an ice cream maker soon.